After growing up in Virginia and Arizona, Jean obtained a degree in accounting from Duke University. Following a few years in accounting she became a Special Agent for the Federal Bureau of Investigation where she met her husband, David, with whom she now works. Government service required many moves, and for most of those moves she and her husband bought and sold their own homes. The result is that Jean has been the client in over 26 real estate transactions. She believes this unique perspective gives her an enormous advantage. She knows what it feels like to have a great real estate agent. She knows how important communication is to the real estate purchase/sale process. She knows how important it is to advocate for your client's position. She has bought in a seller's market and sold in a buyer's market, and learned how to navigate both. She effectively and enthusiastically uses her experiences as the client to provide the very best experience for her own clients. Moving to Maui has been an adventure. When Jean's not working she's scuba diving, kayaking, hiking, traveling or riding her horses, which she moved with her from the mainland. Maui is a beautiful place to live, with wonderful people and true aloha spirit. Jean would love to help you make a piece of it your own. My husband, Bill, and I have recently returned from Maui with the keys to our new Hawaiian home. This has been a long journey for us. Having wed on Oahu in 1989, we have been planning our move to this beautiful state for over 25 years. We have researched homes and areas on other Hawaiian islands with other real estate agents and companies, but in April of this year, we were fortunate enough to connect with Jean and David Nehls at Hawaii Life on Maui. We found them through an internet search, admired their biography, and contacted them as we felt they would be a good match for us. That instinct was correct, and Jean and David have gone above and beyond what we would expect in real estate partners. We provided Jean and David with our wish list, and within hours they had set up a personal page for us to receive real estate notices. This was an extremely helpful and very modern way to look for property. However, in the end, it was Jean and David's skills that brought us our dream home. We had spent more than a week on Maui searching day in and day out for properties and nothing was really clicking. On our last full day on the island, we received a text from Jean and David alerting us to a property that they thought we might like. It looked good to us, so Jean and David immediately arranged for us to see it. And you know what? It was the perfect home, everything we had asked for and more. Jean and David had listened so closely and cared so much that they were able to find the exact home we were looking for. We waited 25 years for the right property and it was Jean and David that found it for us. As I mentioned, we have worked with many other real estate agents in Hawaii, but none of them have had the interest and care that Jean and David Nehls have displayed. They not only found the perfect home for us, but they managed all of the intricacies that go along with it, from surveys to inspections to closing in a highly professional manner. It was important to us to let you know that Jean and David are invaluable assets to the Hawaii Life Real Estate team and to each and every client they work with. We are grateful for their help and have already referred a friend to work with them. A great big mahalo to Jean and David Nehls and Hawaii Life for making our Hawaiian dream a reality! Thank you very much for sharing your thoughts of your experience with Jean and David. I am very happy it went so well. I agree -- they do an outstanding, thorough job, and I am very happy to work with them. I hope you enjoy your new home for many years to come, and I really appreciate your feedback. I just wanted to write you a quick note to sing the praises of Jean and David Nehls who were our real estate agents during the process of house hunting and finally buying here on Maui. We moved as an extended family (three generations) to the islands back in July and the Nehls were very patient at both searching for and showing us properties all over the upcountry area. They were easy to talk and understood the issues of moving from the mainland but also had a grasp for the local market which was essential in guiding us in our search. Jean was very organized and on top of the timeline for the contract progressing through the different stages and reaching a successful closing. This obvious organization helped to alleviate quite a bit of the stress of buying in a new region. So in summary, I would not hesitate to use Jean and David as our agent again and have recommended them to a number of my colleagues. Paul and Joyce J. _______________________________________________________________________________ Just when you think Customer Service is dead and gone, along comes the wonderful Real Estate Team of Jean and David Nehls of Hawaii Life on Maui. I actually met the Nehls while I was with a friend who was looking for a Maui property. I was so impressed with them that I became their client. 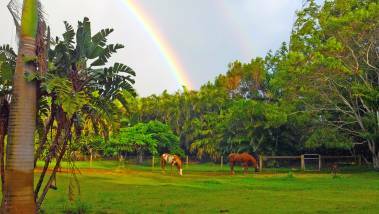 I am a local girl from Oahu and I had decided to retire on Maui along with my 3 rescued horses. I needed a special property that suited my downsized lifestyle, but one that would accommodate my old horses. The Nehls delivered and I have just closed on my "forever" home. They navigated thru the process with out-of-state owners and an off-island buyer with what felt seamless to me, but probably was not so easy on their side. The Nehls commitment to me did not stop at the closing. I am still on Oahu packing up and making arrangements for shipping my horses. The Nehls arranged continuing the lawn service until I arrive, put batteries in the smoke detectors, measured for my appliances, gave me a detailed list of all the utility vendors with their contact info, lists of all the equine vets, feed stores, farriers and the like, lists of where to shop for what including the farmers markets......they even went thru the barn getting rid of spiders. They just don't make people like this anymore. If you need great People who are also great Realtors, go to Jean and David Nehls at Hawaii Life Maui and prepare to be impressed.